What’s this photo collection about? Very simple. 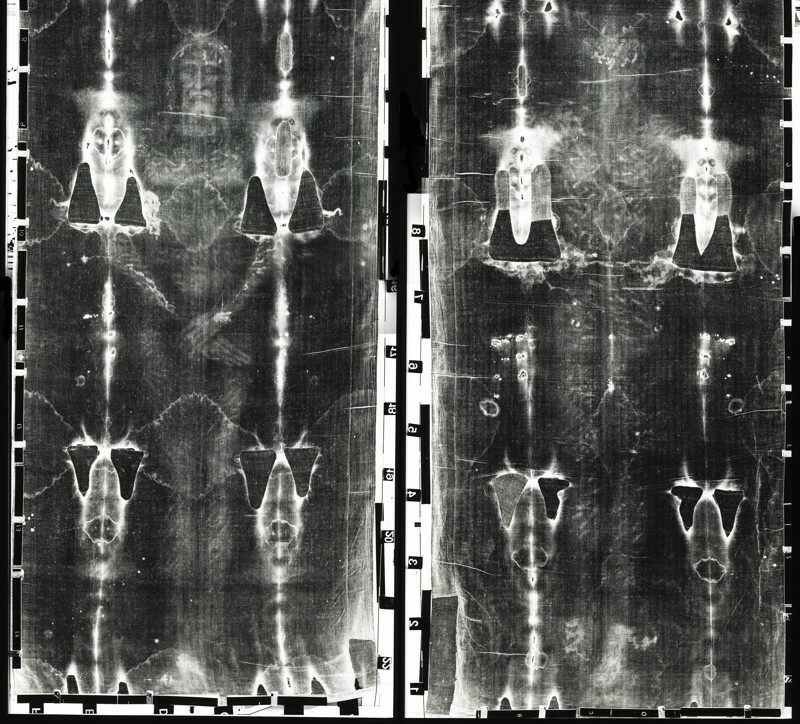 Different photo techniques show different parts of the shroud. Color Film. Black & White. Large format. 35mm slides. Negatives. Ultraviolet light. And more. Blood Marks. Face. Hands. Burn marks. Hair. And more. The photos below (1-21) are accompanied by basic descriptive information to help those unfamiliar with the Shroud, better understand the blood marks and image of the cloth. As Vernon Miller stated, “…It took the camera, with its negative image [photo], to appreciate it.” As is clearly seen below (1, 2) in comparing Vernon’s color and black and white photos of the Shroud, it is only from the negative photo of black and white film that we can appreciate the definite, positive view of the Man of the Shroud. More examples of black and white films are seen below (3, 4, 5, 6). In his collection, there are many 4 x 5 and 8 x 10 black and white films, which illustrate Vernon’s photographic and dark room expertise. He used different exposure times, etc. to produce very fine black and white negative photos of high contrast that resulted in the clearest features of the Man of the Shroud. This image of a man (3. 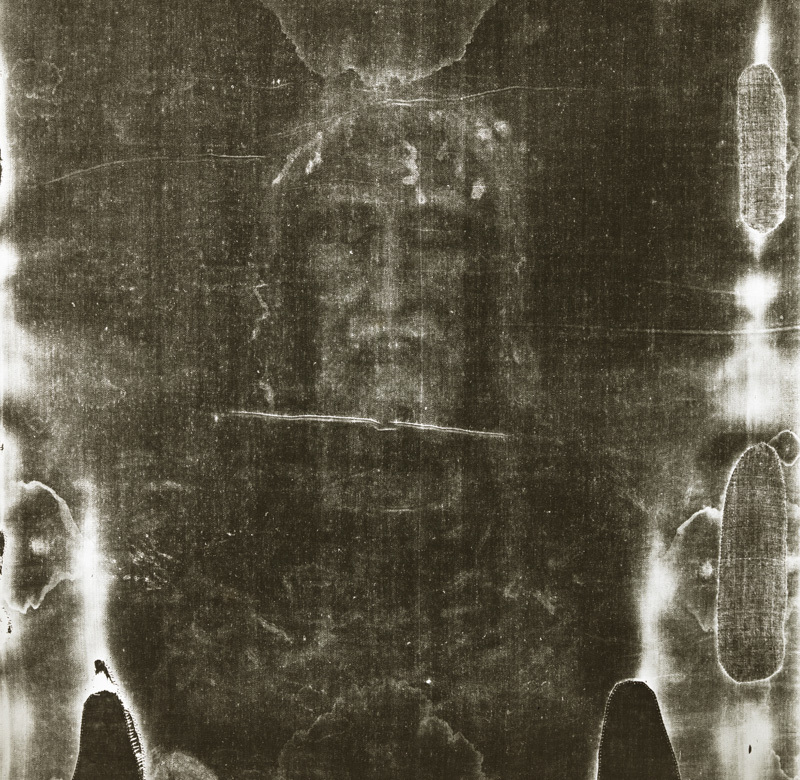 The Old) on the Shroud cloth is what one saw until 1898, when the first black and white photograph of the Shroud was taken. In the process of taking and developing the negative, this is what was seen: the positive image of a man (4. The New) was seen in the negative photo. 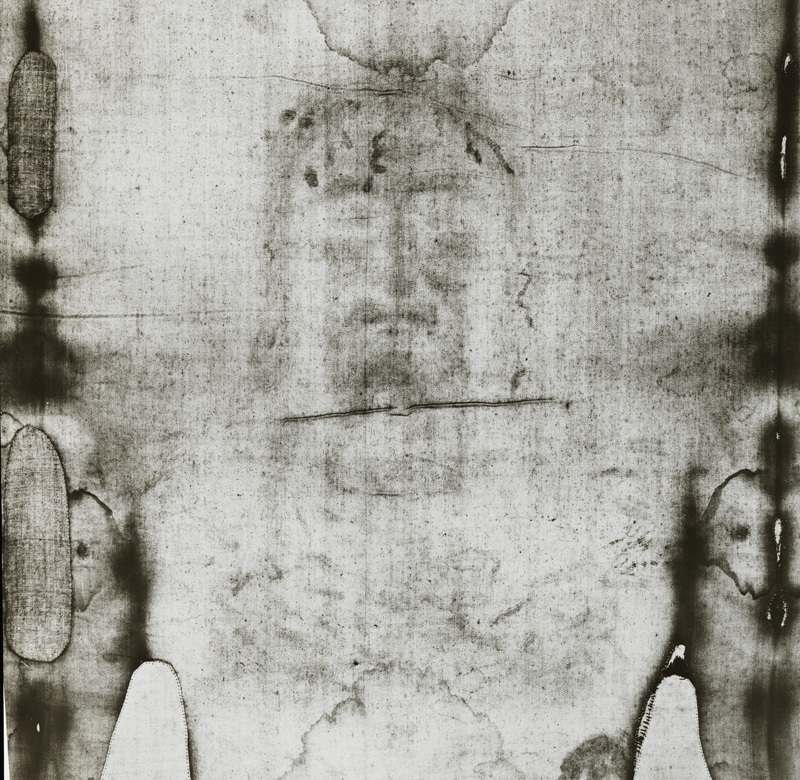 This means that the original image (3) of the Shroud cloth contained a negative image of a man. How did a negative image get onto this ancient cloth? 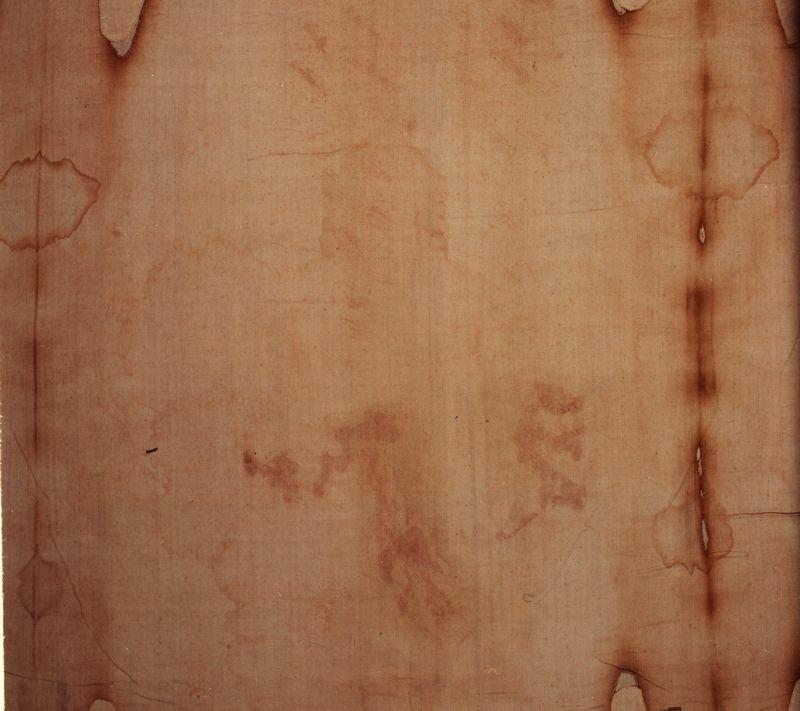 Note that the blood marks are negative on this photo (4), but the blood marks are positive on the original cloth (3). For more information on positive and negative go to Background including Website. And note the swelling under his right eye; and note that his hair flows down to his shoulders. This black and white photo of the Shroud cloth shows a number of blood marks on the back of the head indicating that there were numerous puncture wounds which would be consistent with trauma caused by a cap of thorns. Note the many marks on his back that are likely scourge marks. They will be described later. 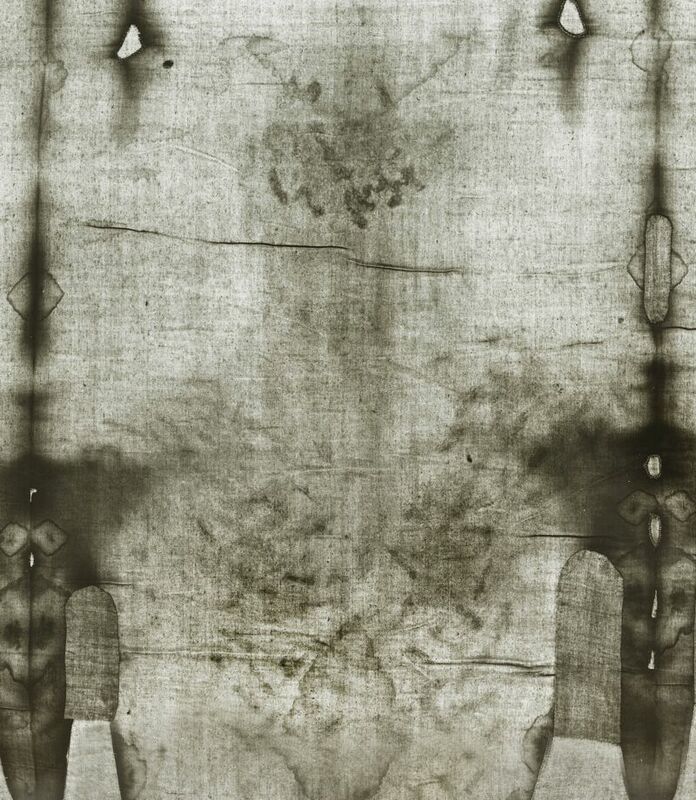 The black and white negative photo of the Shroud cloth again shows a positive image with negative blood marks. Note that the hair flows down the back. Vernon’s beautiful high resolution 4 x 5 and 8 x 10 color transparencies of the Shroud image (7, 8, 9) with its blood marks allow the observer to see the Shroud as seen by the naked eye. This 8 x 10 color transparency (7) includes the back and front of the upper body of the man of the shroud. Note the space in between the front and back of his head. He was laid out on one end of this long linen cloth and the other end was placed over his body. The cloth was sufficiently tucked around his body so that the moist blood clots on his body soaked up into the cloth, leaving the blood marks that are visible. The brown parallel marks and patches were the result of a fire that took place in 1532. The faint image of the entire front and back of the body occurred after the blood marks because there are no image marks under the blood marks. So, the blood marks were the first event, and image formation was a completely separate second event. How this image occurred has been studied but the explanation of its origin remains unknown. Note that there are no side images of the body. This 4 x 5 color (white light) transparency (8) focuses on the chest wound and wrist wound. The upper part of the chest wound shows an elliptical wound with blood that had flowed down from it. The wound at the wrist has blood that also flowed down from it indicating that the body had previously been in a crucified position. 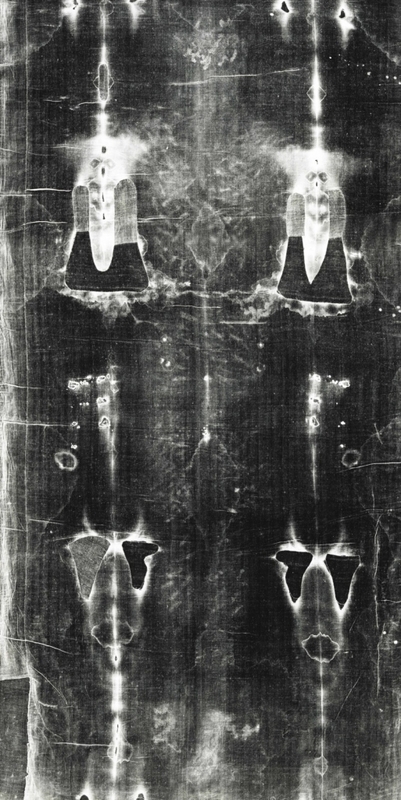 This back image photo (4 x 5, white light) of the blood marks of the feet (9) shows the sole of his entire right foot imprinted in blood. His left foot is partially on top of the right. When looking at the cloth itself, understand that the left and right of the man wrapped by the cloth are the opposite of the marks on the original cloth. Miller took many 35mm color micrographs ranging from 6X to 64X magnification of blood marks, body image, scorch marks, burn marks, water marks, wax, and the clear cloth of the Shroud. It was Vernon’s photographic skill in capturing these microscopic views that allows us to see and understand the Shroud image at its fiber depth. This is a 35mm color transparency (10) taken at 32 x magnification of the plain Shroud cloth where the is no blood or image. This 35mm (11) also taken at 32 x magnification was taken over a blood area of the chest wound. The entire area is yellowed from blood protein and is also accompanied by red-rust colored material which has been proven to be blood. There is more blood in the hollows of the cloth whereas the tops of the threads have less blood in that it has been worn away over the years of folding and unfolding this cloth. This 35 mm (12) was taken over the image area of the right eye at 32 x magnification. Here there is no material accumulated on the cloth and all that is seen is a slight yellowing of the some of the fibers of the threads of the cloth. This is a 35mm color transparency (13) taken at 64 x magnification over the nose of the image. 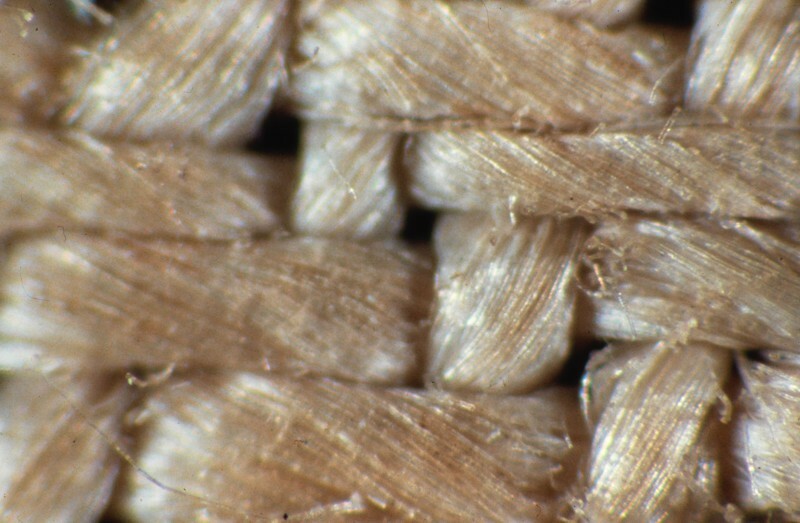 This photo reveals the threads of the cloth and most important the fibers that make up each thread. The yellowed fibers are the basic building blocks of the image. The fiber diameter (10 to 15 microns) is way less than that of the hairs on one’s head. 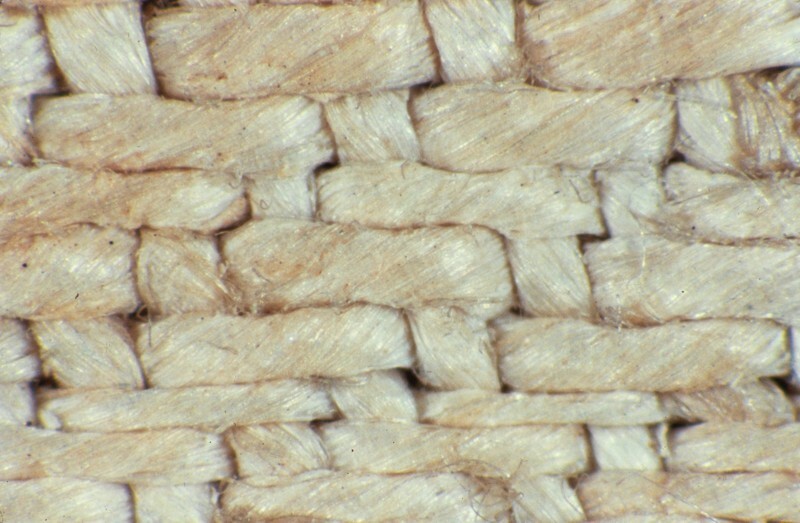 It is these yellowed cellulose fibers from the flax plant that make up the image. If one takes a pin and pushes fibers around it will be noted for the most part, that the yellowed fibers run only one fiber deep. If you follow one of these fibers until it dips below the next thread, the fiber then becomes white. 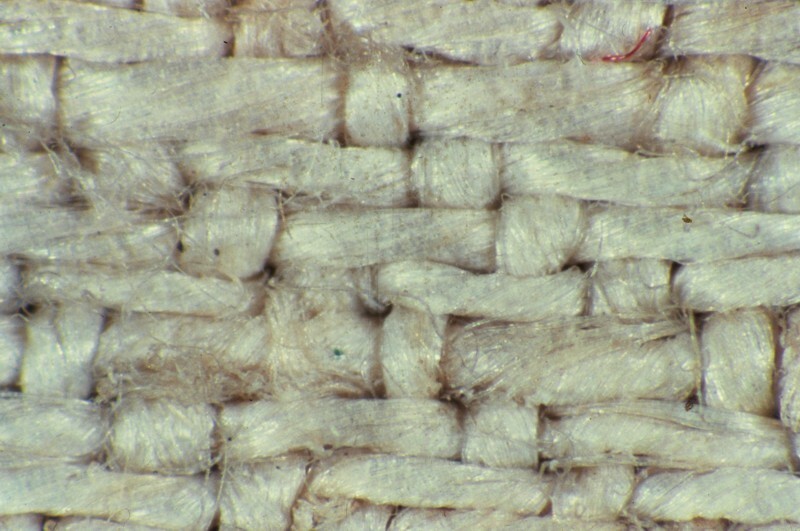 This means that no paint or dye caused the image; otherwise there would be wicking of the dye along the thread or soaking of the dye down into the fibers below. 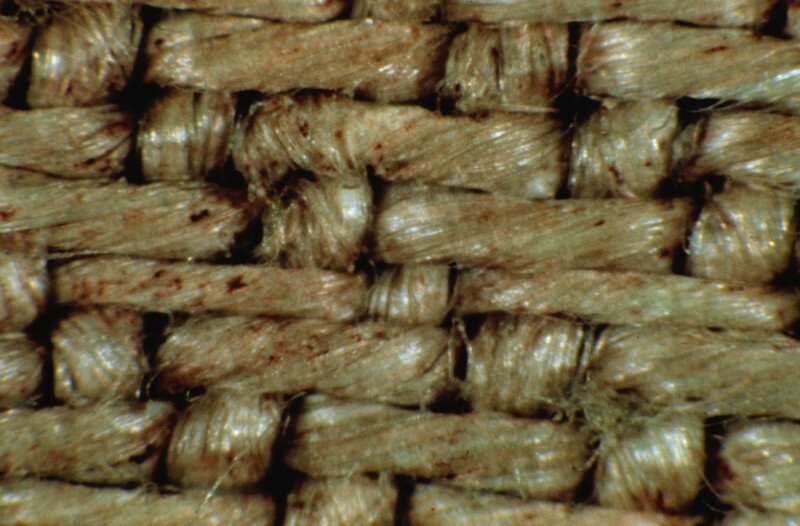 The yellowing of the fibers can be caused by heat, acid or light. The color change is a dehydrative oxidative process which is the same as the degradation of the cellulose. Think of a vase that has covered a linen cloth for years, and when you remove the vase the cloth is white underneath and the rest of the cloth that was exposed to the light of the sun has been yellowed. 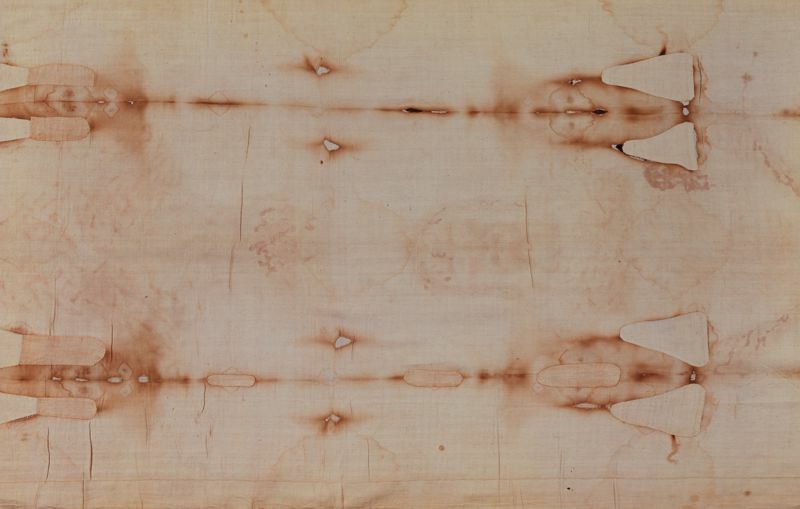 These fibers of the Shroud image are all essentially the same light-yellow color. What makes one area lighter or darker to form the image? If one area is darker than another, more of that area’s fibers are light-yellow. The concept can be compared to newspaper print. If you want it darker, put in more dots. Furthermore, these details are the same for both the front and back images. In contrast to what one would surmise, body weight played no role in image formation. The image marks are very superficial as opposed to the blood marks that sink into the cloth, and some even penetrate through to the other side. 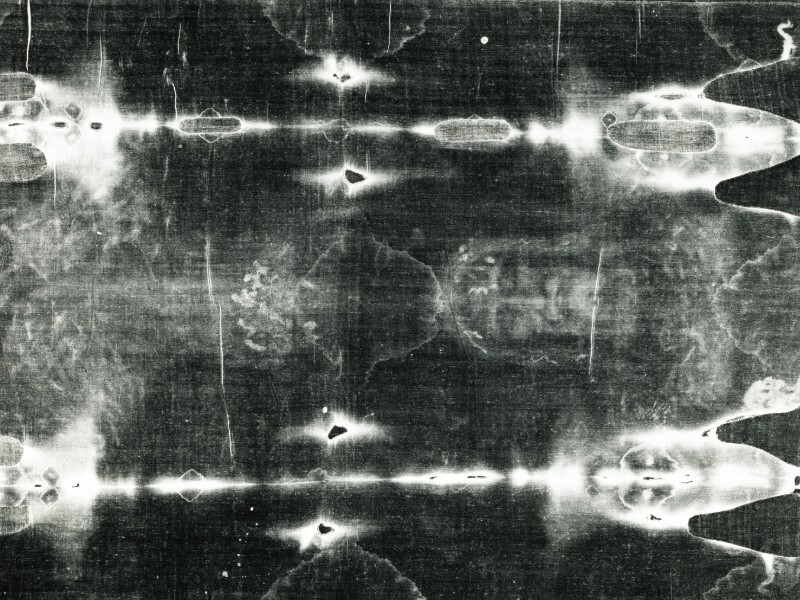 No one has yet reproduced the Shroud image at this microscopic level. 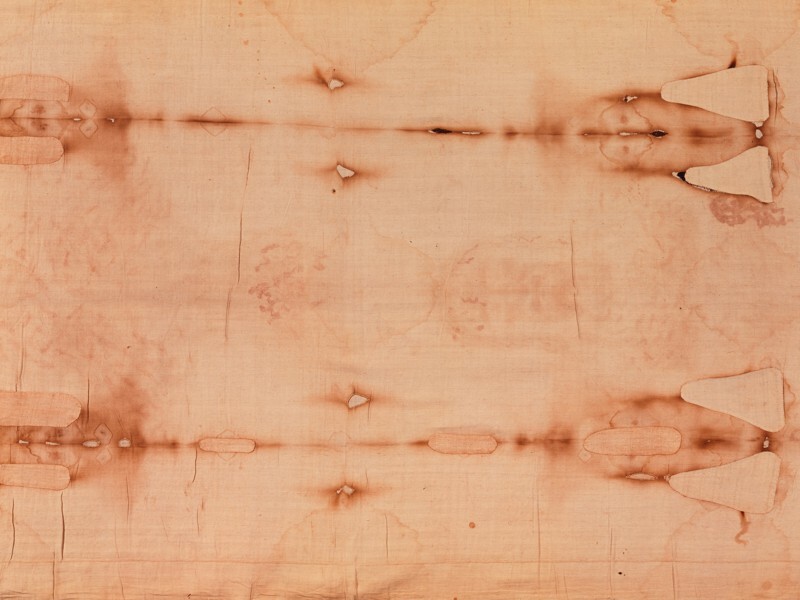 From a scientific perspective Miller also captured many 4 x 5 color transparencies under ultraviolet light for the purpose of studying the Shroud’s cloth, blood, image, and more. His ultraviolet light color transparencies have enhanced the precise imagery of the wounds and blood marks of the Man of the Shroud. The following 4 x 5 transparency (14) is taken with Ultraviolet Light as opposed to White Light. 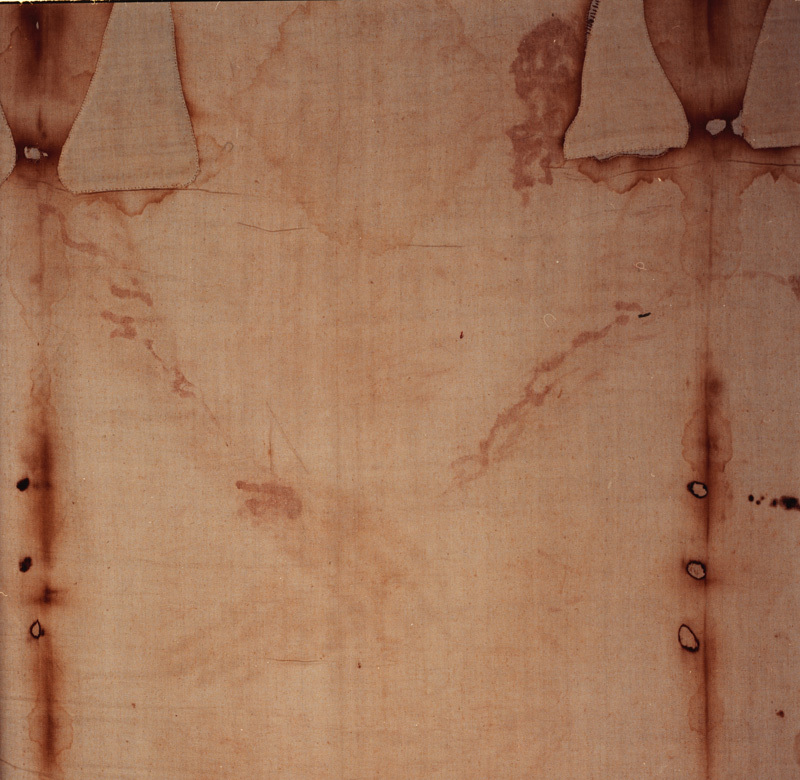 This technique enhances the marks on the shroud, especially the blood. This is the back image extending from the upper back down to below the lower back. At the lower back is a blood flow that extends from right to left. At close observation this blood flow appears to be diluted blood, likely the combination of postmortem blood and pleural fluid that exited from the chest wound when his body was laid out on his back for burial. The rest of the marks on the back appear to be scourge marks caused by a flagrum. A flagrum was made with cords or leather straps that had on their ends metal tips that were dumbbell in shape. These dumbbell shaped marks can be seen all over the back, chest and legs. This 4 x 5 color transparency (15) per visible light (white light) of the posterior lower legs of the image demonstrates the blood marks of feet as well as the scourge marks of the lower legs. This 4 x 5 color transparency (16) per ultraviolet light (UV light) of the same area of the image reveals many more details of the blood and scourge marks than does photo 15 which allows the wounds to be studied in much greater detail. Vernon Miller’s high contrast negatives have brought to light some of the clearest and most beautiful positive and negative images of the Man of the Shroud. The following images compare his original Shroud cloth photos to his high contrast negatives. This black and white frontal image of the original cloth is slightly enhanced making the original image more visible. 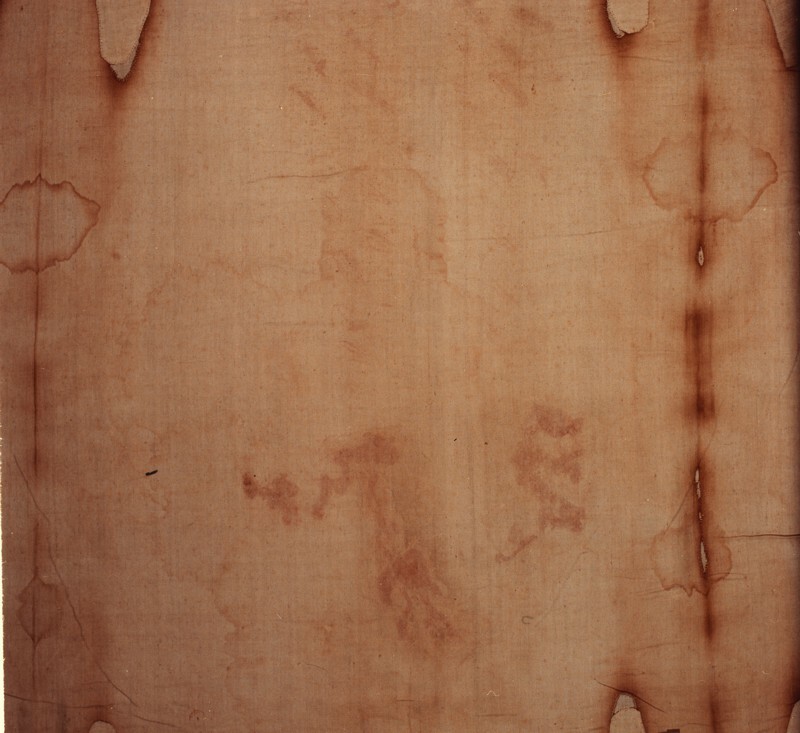 After the fire of 1532, a backing cloth was placed behind the entire Shroud cloth to protect it from further damage. Visible here at the left lower corner of the front of the cloth is a slightly grey rectangular piece of that backing cloth. 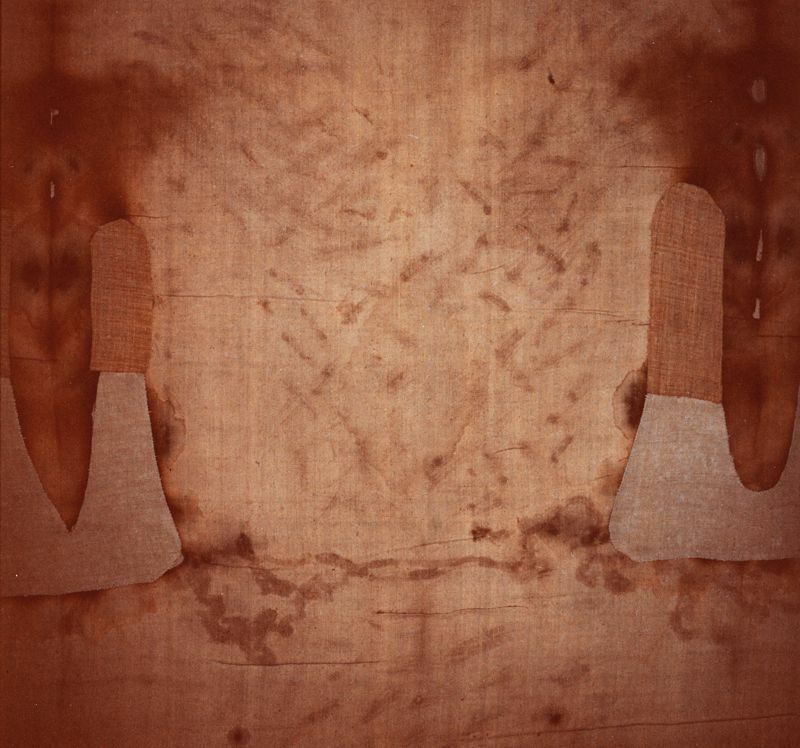 In the early 1970’s, a sample of the Shroud cloth was removed, leaving the small white triangular area on backing cloth seen at the left lower corner. In 1988, the sample for the carbon dating was taken just above the white area, along the edge of the Shroud cloth. Observe the darkness of that area caused by years of handling the cloth by its corners. The carbon dating literature advises against any handling of a test sample to avoid contamination. Inherent to the Shroud cloth is archeological and biological information that gives evidence as to the Shroud’s time and place of origin. Note the long thin strip of cloth that extends the whole length of the shroud. This strip is the same material as the full Shroud indicating that it was stitched close to the time that the cloth was weaved. The only identical cloth stitch to this one was found in Masada which was destroyed by the Romans in 74 A.D. Other evidence supporting that the Shroud had been in the vicinity of Jerusalem, are pollens and faint floral images found on the cloth. 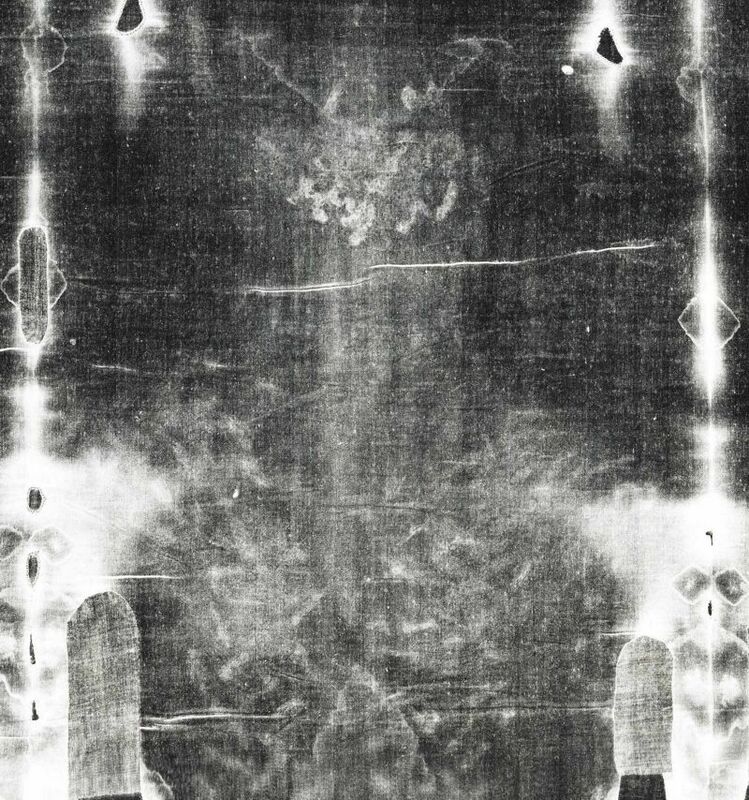 The enhanced image of the original Shroud cloth photo (17) bring forth more detail; however, it is the black and white negative that does so much more. 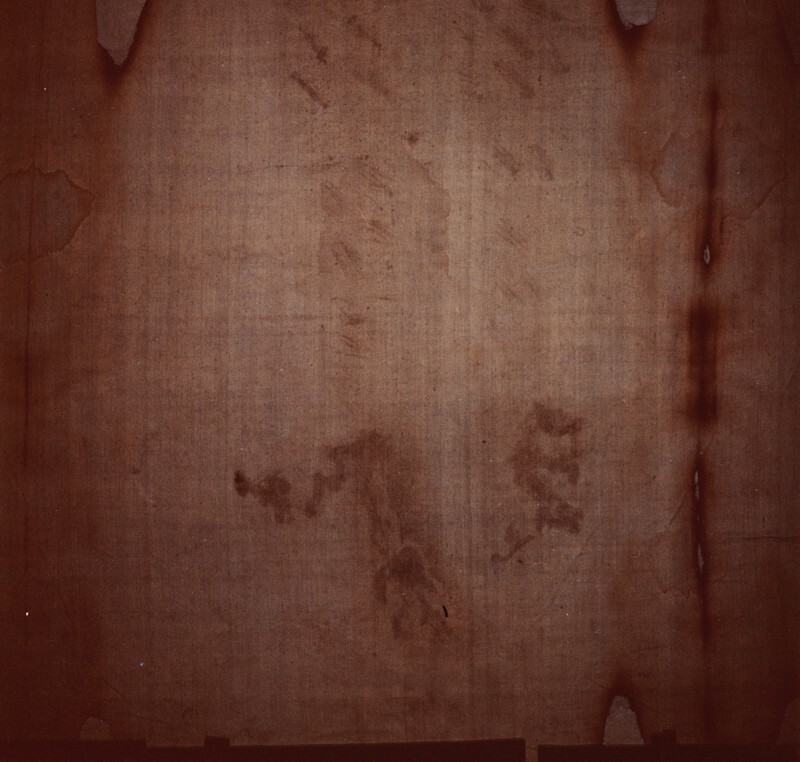 The high contrast negative photo reveals the details of the form of the man (positive image) that was hidden in the negative image of the original cloth. Note the off-image blood mark at his right elbow. That blood flow started from the wrist wound hidden under the left hand and flowed down the arm to the elbow, then around to the back of the arm; it then pooled into a larger round drop which then dripped to the ground. (The same thing happens when you raise your wet hands up out of the kitchen sink; you can feel the water flowing down to your elbows.) The moist blood clot at the back of his upper arm simply soaked into the cloth as the Shroud was tucked around the side of his body. Note, the cloth was wrapped around the back of the upper-arm, yet no image is there. This then tells us that the blood marks are a simple contact process, but the image is not a contact process. For if it were, we would see the image of the back of the upper arm which had contact with the cloth. B & W positive photo of cloth with crop of the negative back image enhanced. This black and white back image of the original cloth is again slightly enhanced. This black and white negative clearly reveals the scourge marks of the entire backside of the body. Notice how they are oblique on the upper back, horizontal over the lower backside and again oblique on the lower legs. As if one or two men stood on each side of him and struck upward on the back, horizontally across the lower back and downward at the legs. This has all the characteristics of a true scourging. 1. The first event occurred as the body of a crucified man was laid out within the folds of this long cloth. Evident are the blood imprinted wounds of his torture. 2. The second event was the appearance of a man’s image not yet proven to be made by human hands.